Düsseldorf, May 2014 – In the context of their extensive collaboration to improve the efficiency, performance and sustainability of packaging applications, Reifenhäuser Kiefel Extrusion of Troisdorf/Germany and DuPont have developed a material and cost saving medium barrier 9-layer film for thermoforming applications. Key to a weight reduction of up to 20% and improved packaging performance over incumbent 7-layer PA/PE structures are Reifenhäuser’s versatile 11/9-channel EVOLUTION barrier blown film technology and a new high stiffness DuPont™ Surlyn® ionomer sealant resin, which allows for sealing at lower temperatures and provides a broad operating window. Further advantages include superior perforation and abrasion resistance as well as an improved fat barrier, making the new film a first choice for vacuum packs containing hard and sharp products, such as mature cheese or meat with bones or smoked ham. Thanks to the high stiffness of the Surlyn® sealant layer, film thickness can be downgauged by 20% with no loss in stiffness. Whilst common 7-layer film structures for thermoforming applications have typical thicknesses of around 240 µm, the thickness of the new 9-layer film is just 200 µm. In spite of this significant reduction, the new film feels just as robust as current structures. And because of its higher gloss and transparency, shelf appeal of the packed products is increased. Beyond downgauging, the material costs for new PA/Surlyn® structure are around 10% lower compared to 7-layer PA/PE structures. A further financial benefit results from a reduction of up to 20% in ecotax due to the reduced packaging weight. And thanks to the outstanding seal performance of Surlyn® even through liquid or powder contamination, the number of rejects along the entire distribution chain is reduced significantly. Summing up these savings, the additional investment for a 9-layer blown film line will pay back in the short term, because the cost for a system including 9 extruders and blending units as well as a bigger die head are just 10 to 15% higher than those for a 7-layer line. Taking into account just the resin related cost savings of 10%, the payback time for these additional costs will be less than six months. This can be further accelerated, if higher sales prices for the superior films can be achieved. At the DuPont and Reifenhäuser labs, major optical, processing and application characteristics of the new 9-layer structure, produced with Reifenhäuser’s EVOLUTION barrier blown film line, and with Surlyn® on the internal surface, were compared to a standard 7-layer structure with a PE sealing layer, both combined with a PA layer. In these tests, the new 9-layer structure provided a gloss gain of 10% and a 13% higher transparency over the incumbent structure, and also exhibited improved thermoforming performance. Due to the special stress-strain behaviour of the Surlyn® sealant’s specific chemical structure with ionic crosslinking, the strength of the stretched areas of the film increases. Thanks to this so called ‘strain hardening’, film thickness in the bottom corners of the thermoformed packs is higher than for PE based sealants, which get weaker in stretched areas. Thus, despite the fact that the conventional 7-layer film was 20% thicker before thermoforming, both structures had identical film thicknesses in the corners after thermoforming. A further advantage of using the new Surlyn® sealing layer with its cross-linked molecular structure becomes obvious under point loads, e.g. caused when edges of vacuum-packed hard cheese, dry meats or bacon constantly press against the film. Under such conditions soft polymers in the structure can be displaced, weakening the film and creating micro holes over time. This is especially true for polyethylene copolymers used for high performance sealing applications. 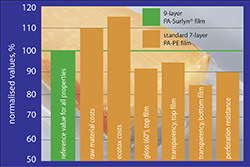 In contrast, the much harder Surlyn® sealant polymers withstand such mechanisms, resulting in a 10% higher perforation resistance for the 9-layer PA/Surlyn® structure compared to the 20% thicker 7-layer PA/PE based film – even in the corners of the thermoformed pack, which are often prone to leakers. Cost-efficient production of the new multilayer thermo-formable 9-layer structure has been made possible thanks to the versatility and high precision of Reifenhäuser Kiefel’s EVOLUTION ULTRA RANGE extruders. Developed for easy processing of complex film structures with all kind of resins, they provide outstanding flexibility in terms of choice and amount of high performance polymers including high-barrier grades, adhesives and sealants, so allowing use of the most suitable materials at minimum costs. Depending on the required film structure, they permit both very high and very low output rates at low melt temperatures. The possibility of combining up to 11 channels enables the production of asymmetric films with minimum curling. Their advanced die head technology with precise individual melt distribution allows for extreme downgauging. The superior flatness of the film provides improved printability and constant performance over its entire area. Reifenhauser Kiefel Extrusion GmbH is member of the Reifenhauser group which consists of six business units and over 1,200 employees and is the largest extrusion network in the industry. The company is a leading German manufacturer of high quality blown film extrusion systems and peripheral equipment for the production of flexible films and has over 40 years of a successful history worldwide in the production of simple mono layer up to sophisticated 9-layer barrier film lines for a wide variety of applications. EVOLUTION is filed as registered trademark of Reifenhäuser.